Posted on 21st February 2018. 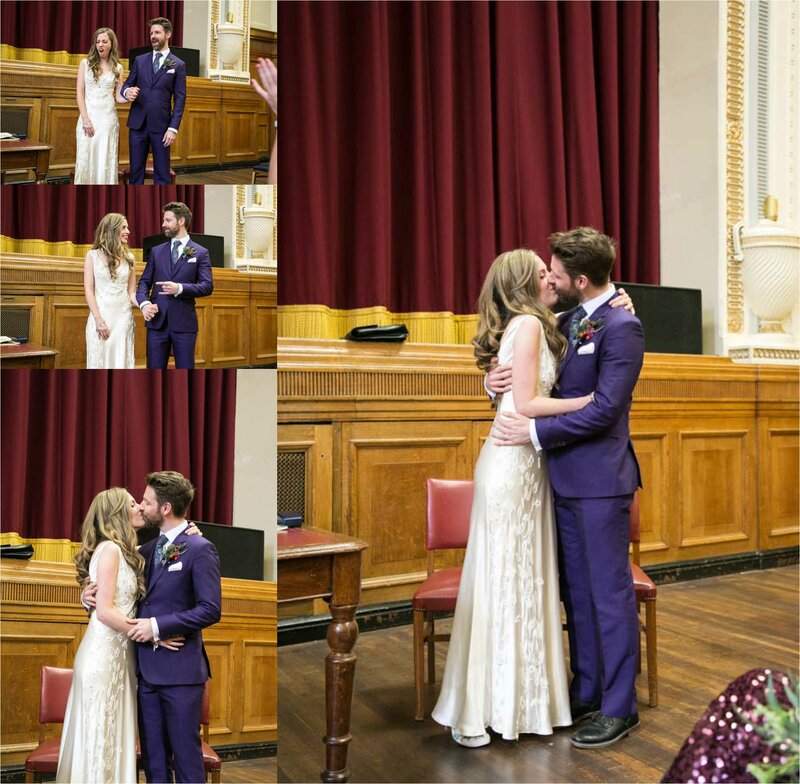 Emma and Chris had an incredible quirky rock + roll wedding at Islington Assembly Hall, London. 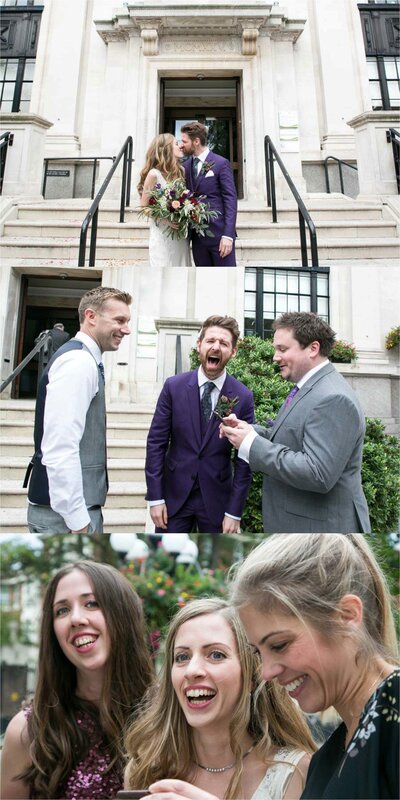 They are both such wonderful people, with huge personalities, and the wedding matched them down to the ground. 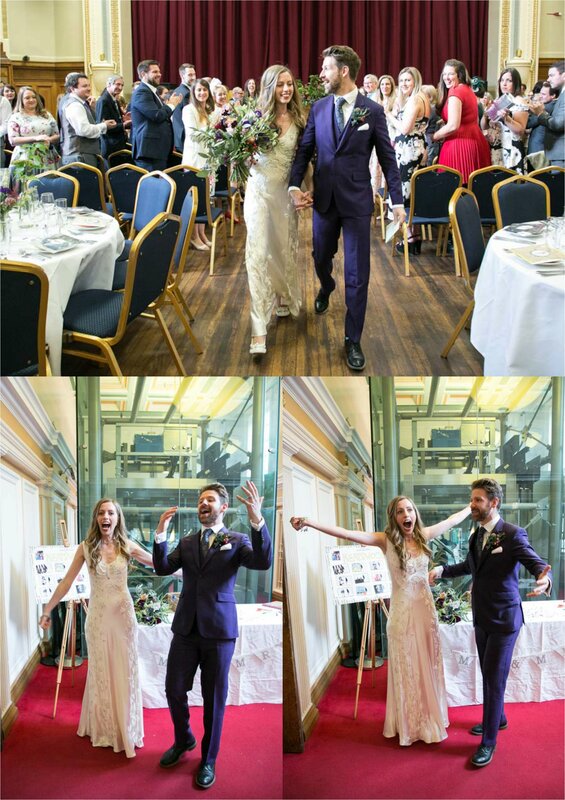 Chris is an actor and Emma works at the Royal Opera house, and the natural venue for such a theatrical couple was of course a theatre. 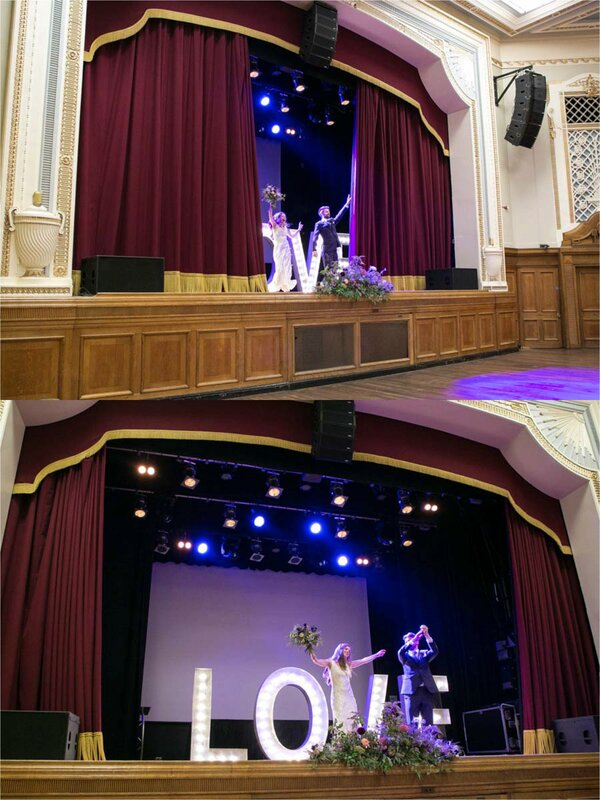 The Islington Assembly Hall is an amazing space, with it’s 1930’s original music hall features lovingly restored. It has an amazing stage, original features, and an incredible sprung floor for all that dancing! I’ll let Emma and Chris fill you in on the details of their incredible day and the planning process. 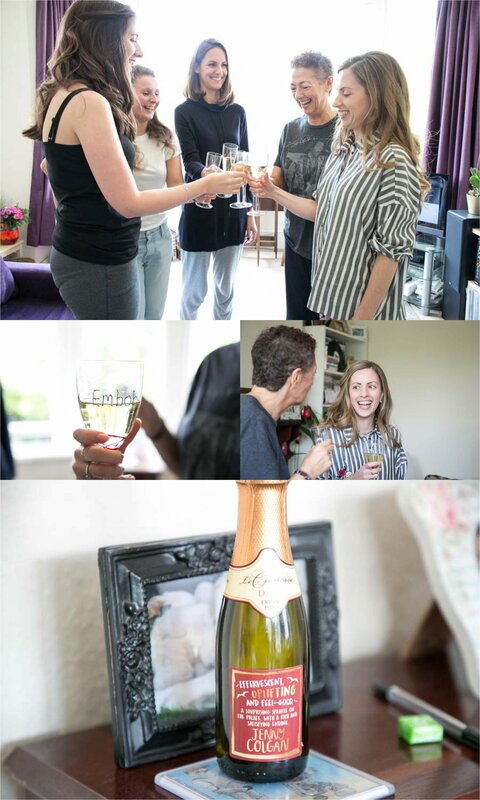 “We met at friends house party- I came with my sister & friend and he came on his own as a friend of someone else’s. We didn’t start chatting til near the end of the night but my friend Emily could see the sparks fly! He added us all on Facebook and we went on a few ‘dates’ …we both loved music, movies and theatre and days out in London so hit it off great! On his birthday last year I took him to the theatre followed by dinner where we’d meet my and his sister. Little did he know I’d also invited his brother and best friend to come from Bristol as a surprise. We had a great day out and arrived home late… little did I know his plan was to propose that day! So as we were getting ready for bed he got down on one knee and popped the question! 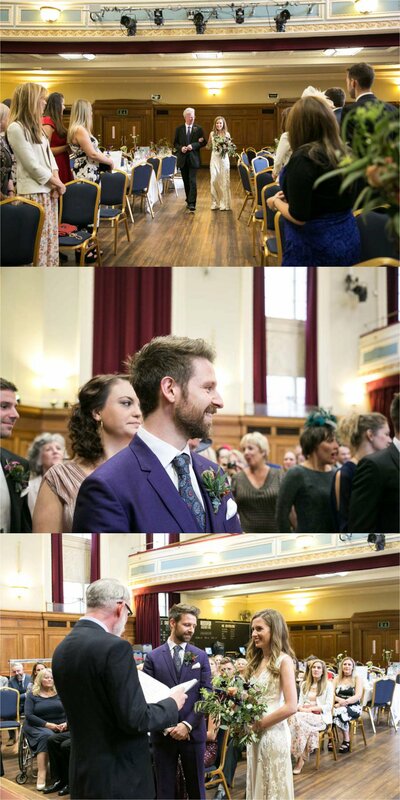 We were definitely after a london wedding so browsed a few locations quite central. We both love Islington due to many trips there, my first job and chris living there once. 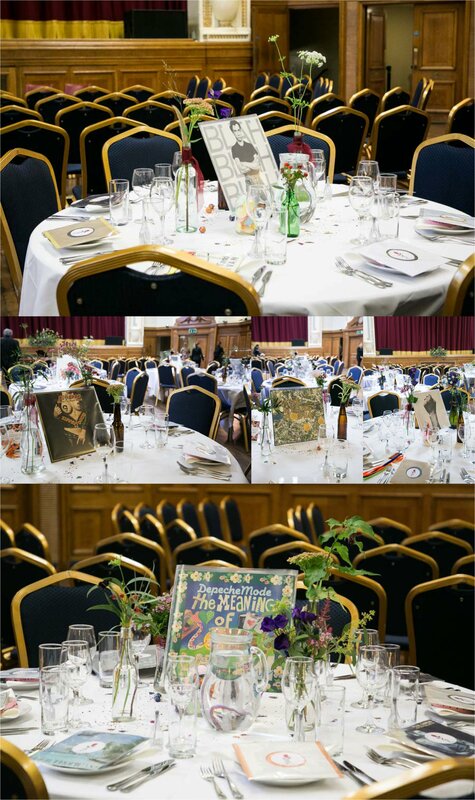 A huge passion for music also helped us decide: picking an Islington music venue won us over! 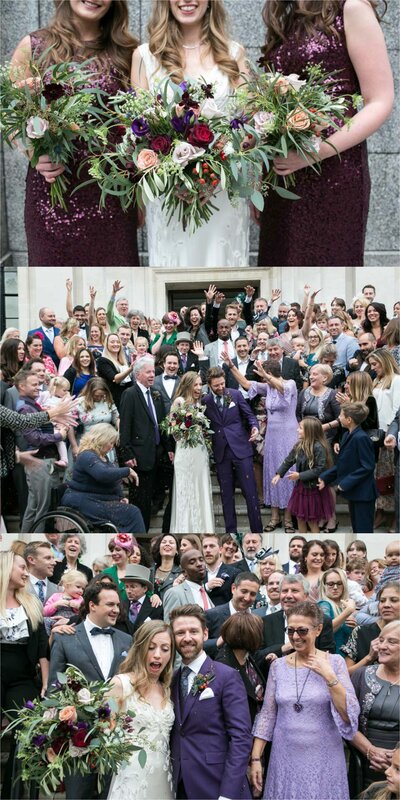 I’ve always loved rich autumn colours and Chris always loved the idea of a colourful suit! So we knew it would be a bright and colourful day! 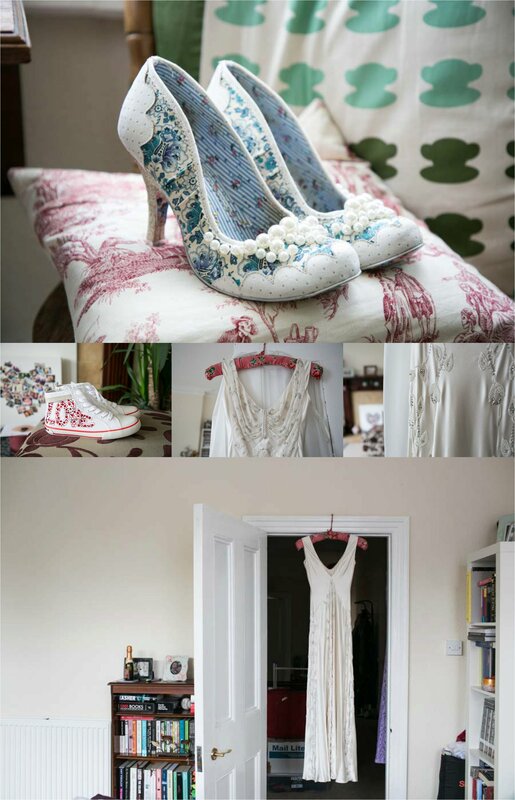 I was extreamy lucky and soon after we were engaged- jenny Packham who’s style I loved- had an end of season dress sale. I was there in a flash and managed to nab an absolutely gorgeous bargain dress! Flowers were fun to pick- with the help of a friend who has her own florist business I has no doubt she’d be the woman for the job & after a chat about what I was after with the autumn theme- she picked some amazing combos! And for my bridesmaids- my sister and chris’s sister- I knew I wanted lush deep vibrant colours too- and again, happened to find an amazingly rich wine colour dress for them! I had my sequiny/ beaded dress and red lips and a small Star Wars bracelet to finish it off- a little treat for the die hard fan chris. Decor it’s self we kept minimum due to the building itself being so fabulous. 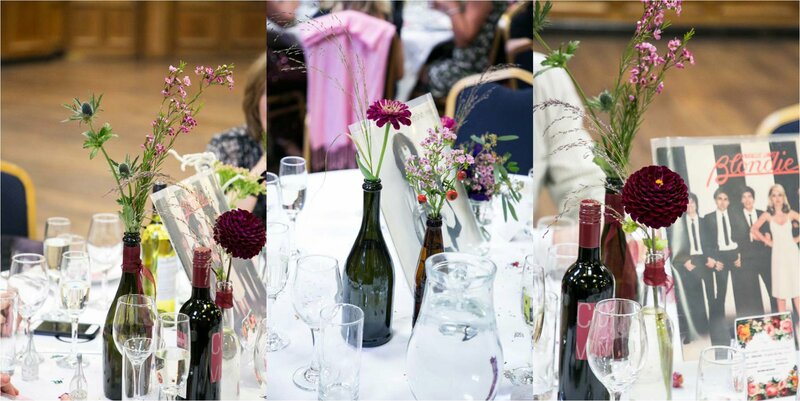 We had gorgeous autumnal flowers on the stage and tables to add colour. Our main theme for the day was music! 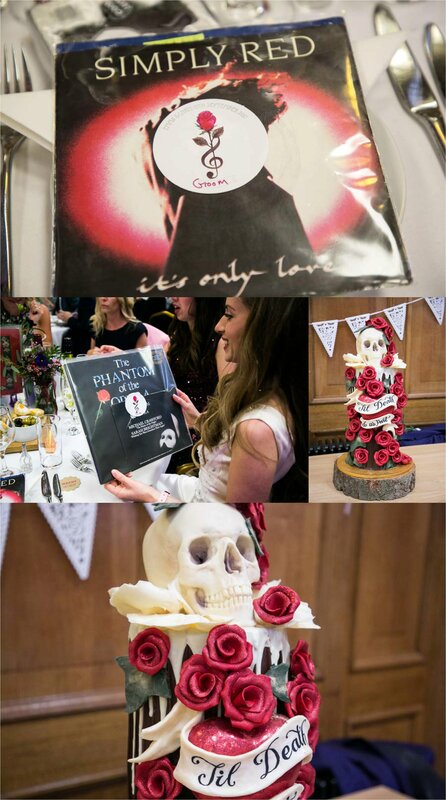 So each table had a record- all from a band we’d seen together. 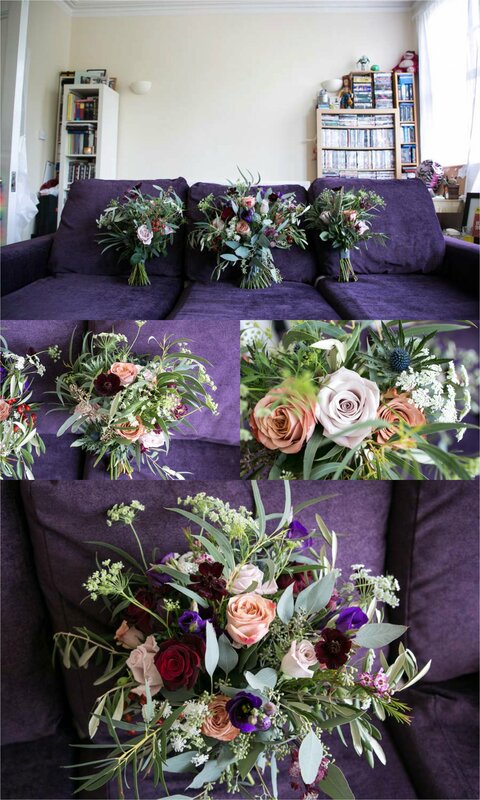 Our florist- sam @ violets and velvet- outsold herself with the bouquets and bunches on each table- they were Devine! 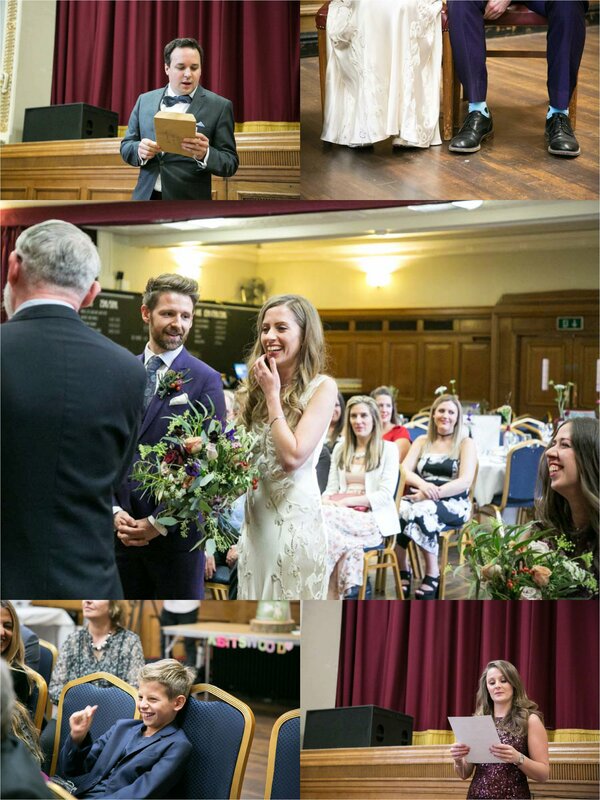 We had the choice of 5 ceremonies – and went with one of the longer ones esp as it had words about staying individual as well as together- we find that very important. We had 3 readings- 1 from my mum- something she picked about marriage. The 2nd was a keats letter- a man who always wrote about love and someone I’ve always had an interest in- it being my surname and that he lived not too far from where we grew up in north London. The 3rd from chris friend- was a Winnie the Pooh piece. About love, friendship and being together. This one made everyone cry. 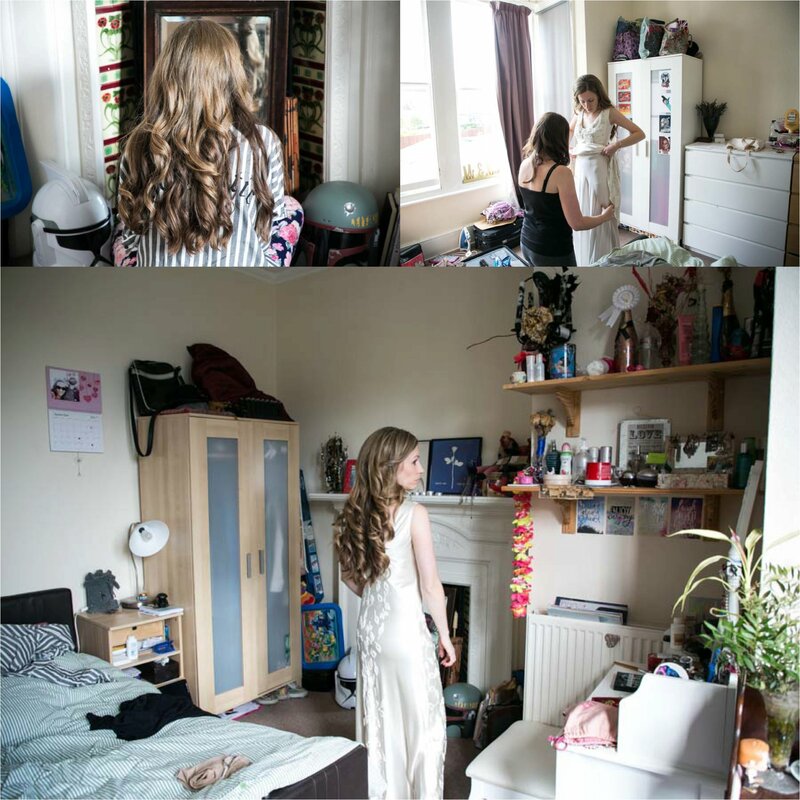 For photography, I was recommended Rebecca from sam the florist and checked out her webpage… she was just what I was after- descriptions saying natural and realistic pics and very adaptable. She had great ideas, was very easy going and snapped away on the day- you barely noticed she was there. 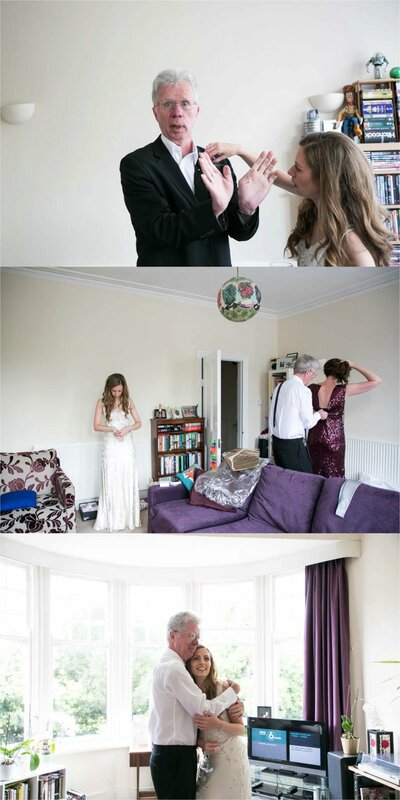 I was never into havin really posy pictures so the natural ones were just what We were after! The first dance song was chris’ pick- he told me a few years back how this track was his favourite- the words and music- just all about love. Nick cave- into my arms. As this is a slow song- we knew we’d live a funky one straight after- to get everyone else on the dance floor- so from nick we went straight into a eagles of death metal track- one of our fave bands we’ve seen together, called ‘I only want you’! It worked- everyone joined us for this one and we danced like crazy! -Any words of advice for other couples planning their wedding? Is there anything you would do differently? Hmmm mainly I’d say- don’t stress too much over timings! 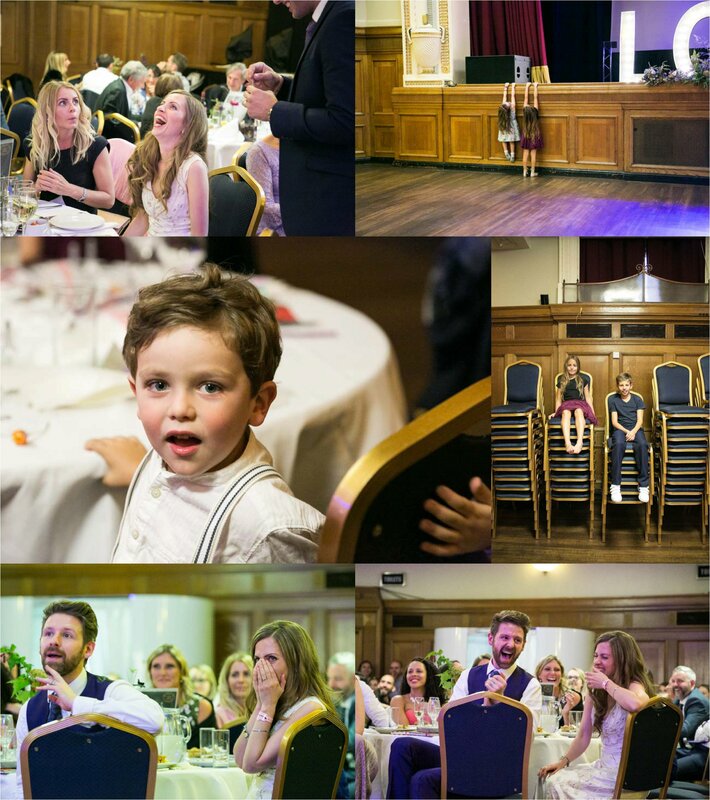 The venue organisers will run through it with you… and on the day something’s may go over – but just go with it! I was always quite calm leading up to it. Keep a separate email folder for wedding stuff and make a couple of lists of things to do and double check – but that’s it! -What was your favorite part of the day? All of it! Haha… the Dancing! I barely ate or drank all day- so weirdly- the very end of the night me and chris were staying in a hotel up the road- so after packing up and saying our goodbyes- we walked back on our own and chatted about the day- just us.